Me with my poster at the 227th AAS Meeting in Kissimmee, Florida. 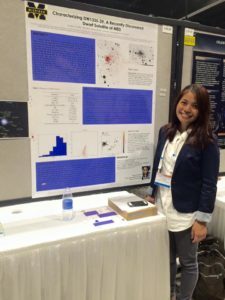 I am Andreia “Dreia” Carrillo, Filipina astrophysicist. I am from Baliuag, Bulacan, Philippines, an hour away from Manila, which is famous for its lechong manok (roasted chicken) and chicharon. But now I am based in Austin as graduate student in University of Texas where I eat tacos once a week –admittedly on the lower tail end of the distribution of Austinites. My work involves stellar populations, both resolved into stars and unresolved where you get light from a group of stars. I aim to bridge knowledge between the two realms! I work with Keith Hawkins on Galactic Archaeology to study the formation and structure of our own Milky Way galaxy and how that bleeds into other research areas (planet formation, satellite population, etc.). We have tons of data from Gaia and high-precision spectra from multiple surveys (all available online! to anyone!) that we use in my research. I also work with Niv Drory and Shardha Jogee on decomposing spatially-resolved galaxy spectra into different stellar populations characterized by certain age and metal-content. I do this to uncover the galaxy’s star formation history and to see whether or not what we find aligns with what we know currently about how galaxies form. I have also dabbled on dwarf galaxy research back in undergrad (supervised by Eric Bell) and characterized a dwarf galaxy in the M83 group using HST and ground-based data. Learn more about what I do on my Research page. Aside from research, I also thoroughly enjoy giving back and getting involved in outreach activities. This always gives me a deeper purpose for why I am studying the universe. That’s a cool thing and you can’t not tell people about how cool it is! Learn more about how I give back on my Outreach page. When I am not working on astronomy-related stuff, I like doing song covers, playing the guitar, cooking, catching up on sleep, and playing squash. I also love to travel (not so easy anymore with my grad student money– oops!) and just getting immersed in a different culture.